I would have to say that I have no personal experience with drinking games. I can honestly say that this product is not for me, and I don’t think I can recommend it simply because I didn’t try it out. At least I didn’t try out the drinking part. 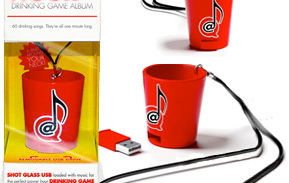 The Shot Glass USB comes with a USB drive that has 60 songs, all of them approximately one minute long. As the first song by Ali Spagnola states, you take a drink after each song ends. In case you are worried about getting too drunk to hold the shot glass, it comes with a removable lanyard. The USB drive full of the music stashes nicely underneath the cup itself. This is where I could get really preachy about alcohol and drinking responsibly, as I must admit that something like this could seriously encourage drinking irresponsibly. Personally, I would love to see a “who passes out first” contest between Marion from Raiders of the Lost Ark and Legolas from Lord of the Rings. My money is on Marion. If you are not in an AA twelve-step program and would like to check out the Ali Spagnola Power Hour Drinking Game for yourself, then you can buy it for about $29.99 here.